Hushed, angry voices drifted up out of the nothingness, whispering in tongues Noel had never heard before. He opened his eyes as much as he could, but his mind was still dazed and his body coursed with an impossible ache. Firelight danced across the cave walls, casting monstrous shadows, blurring the ancient pictographs, so they disappeared altogether in the confusion. Taree had given him the potion and left him there to live or die in the Dreaming. Now a man and woman spoke from somewhere unknowable. Perhaps it was the Wangarr debating what was to be done with the pale-skinned elf, who presumed he could become Yolngu and touch the hand of creation. He had gotten what he needed though. He knew about the mountain where the ones who listened to Fate lived. He had seen the hidden entrance to their Shambhala just below the summit, felt the roaring wind ripping through him, the ice tearing at his flesh. The mountain had cast him down, and he had died, he thought, his bleary mind attempting to make sense of the strange coloring of the rocks, the shadows of great beasts looming over him, and the rancid fetor of wet yak, made worse by heat of the flames. He had been carried away, slung over the back of some animal. “Where am I?” he croaked weakly, attempting to sit up, only to fall back groaning against the pain. Swearing through ragged breaths, he leaned his head forward to look down at what was left of him. His right arm, wrapped up with sticks and bloodstained linen, was bound tightly to his chest, where oozing wounds were covered in long, slender leaves coated in thick brown sludge. Whoever rescued him definitely wasn’t a proper healer, not even a doctor of men, he thought, which caused some concern over the wellbeing of his leg. The bones had torn through muscle and flesh, so it was a decent candidate for some vulgarian butcher, upon deeming it useless, to hack it away, given half a chance, and considering he had no idea how long he had been lain up there, unconscious, plenty of chance had been had. His cloak was laid over his lower half as a blanket, so he gingerly pulled it away, heaving a grateful sigh at finding both legs still attached, the right one, black and blue from hip to toe as far as he could tell, bound much the same way as his arm, primitively. Aside from bandages and poultices and the sweat that poured out of him, he was completely naked, so he tugged the cloak over himself and lay his head back in the pile of smelly furs, made his sickbed. The mastodon lumbered toward him, surprisingly delicate feet attached to gargantuan legs shuffling across the hard earth, the shadow shrinking, becoming more human with each step, until a young, dark-skinned man wearing several pelts, knelt down beside him, leaning his bald, tattooed head over him, peering at him with eyes framed by old-fashioned wire rims. “My rucksack?” Noel said, doubting there was much chance the man spoke English. The stranger looked over to the slender alien still casting a willowy shadow that crawled up the cave walls and across the ceiling, standing carefully out of view. His companion sighed, extending an arm, pointing to something on the ground, and the man nodded, got up from Noel’s side and became a mammoth once more. He watched as the shadow crossed the cave then stooped down, and soon he could hear his things being stuffed, slapdash, into his bag. His belongings had been searched. He couldn’t say he wouldn’t have done the same thing, in their position, but he might have had the courtesy to put things back where he found them before he woke. “Anyai mihkt uer apshar. Nyet wa Ohamet,” came the man’s voice, deep, his words stirring low, as if spoken from some ancient place, untouched, unstained. Noel was about to speak, or rather to try and find some single-handed charade to indicate a massively valuable fairy tonic that would save them all the trouble of poultices and splints, could be found somewhere in his bag, if only the man would help him sit upright, when the young woman, alien only in her simple beauty, came out of hiding, cast golden in the firelight, her footsteps impossibly silent. She stared down at Noel with harsh black eyes as she laid a hand on the man’s head. “Er ush Harvwi,” she whispered imploringly, dark curls falling from her shoulder as she spoke, accentuating the long slope of her honeyed neck. Noel might have been taken by her, beautiful as she was, but it was clear she had no interest in him, not even an interest in helping him as she narrowed her eyes. “Rucksack,” he said to her, pointing to the bag sitting next to the man. She made an impatient noise in answer, shaking the man’s head with her hand, as if to urge him away, causing him to laugh quietly. 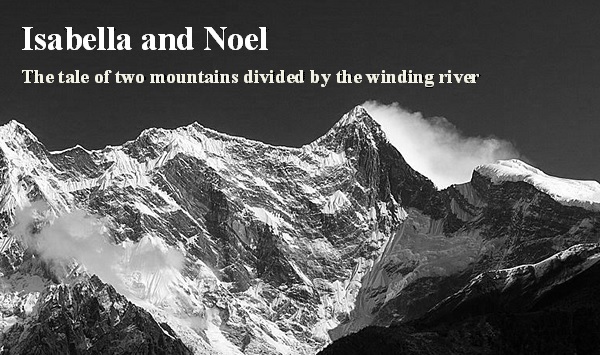 “Rucksack,” Noel repeated, holding out his hand. “Ursht Ohamet ot,” the man smiled up at her. “Baga!” she scoffed, sitting down cross-legged on the ground with a groan, taking Noel’s pack in her lap and tugging it open. One by one, the woman removed Noel’s belongings from the bag, holding each out to him in turn, all the while wearing a disgusted look on her face that somehow made her seem all the more appealing, and seemed to bring some measure of joy to her friend, who watched, stifling his laughter, as she showed Noel tiny trousers, shrunken doss bag, the Book of Ages, his favorite lounge chair ‘borrowed’ from Murphy three years ago and never returned, all of which she tossed aside without a care, as Noel gingerly shook his head at her, knowing it wouldn’t be long before she grew tired of this game of discover what the injured man needs from his rucksack. “Please, be careful now,” Noel sighed as she chucked his bedroom slippers aside, hitting the fragile book in its threadbare spine. It had survived the millenniums only through the great care of its keepers, none of whom had been irate women, he thought as she pulled out a miniature tea kettle and breathed in annoyance. A second later it landed with an unceremonious clang on the hard ground. Noel wasn’t certain he could take this game much longer either and was just wishing he had some of her things to throw around in frustration when, finally, the woman held up the opalescent bottle of Iachaol by its thinly waxed stopper. “That’s it!” He shouted, causing the others to jump and him to grab at his ribs in agony. It took a bit for the pain to subside, but when he looked back, the woman was holding the elixir out to him, her mouth drawn tight. “Thank you,” he managed to mutter as she put the vial in his hand. Her face softened slightly, almost into a smile, and she nodded her head, though it was obvious she didn’t particularly want to do that, but good breeding won out over her incessant desire to sneer at him. Getting that stubborn bird to show any sign of humanity was like trying to move a mountain… while lying on your back, half dead, No thought. He might have smiled too, but it hurt too much, and he was certain there hadn’t been much good about his breeding. The dark fairies, on their floating islands in the South Pacific, had always been a secretive bunch. They lived in the mountain mists, shunning outsiders and avoiding contact with anyone as much as possible, though for centuries the men, who inhabited the parts of their islands that weren’t perpetually enshrouded in a veil of clouds, wove fairytales regarding their few encounters, some good, some frightening, to say the least. What men did not know about the winged creatures of the mountain mists would decidedly alter their entire view of the history of the world, give them cause to question everything they believed about the human species as a whole, and vastly, vastly improve their medicinal sciences. But the dark fairies had no qualms with dismembering a few men, women and children over the ages in order to make certain man-kind kept their distance. The only thing that stopped them from killing Phileas Foote was Liam Godfrey, who apparently was descended from some tribal princess. Noel was still amazed Phileas had managed to procure the Iachaol. He would have to thank Liam for saving Phileas’s hide the next time he saw him. “Wa’er, pweashe,” Noel said, his teeth clenched around the stopper. “Er… I bean…” He left the bottle hanging between his teeth and pointed over his head to the bowl, then pretended to wipe his face and chest before holding an imaginary cloth over his open mouth, hoping they would get the picture. The woman reached for the rag in its bowl as Noel gripped the bottle and pulled the cork free, with a pop that filled the cavern. The vessel seemed empty at first glance, but Phileas had told him Iachaol was so potent, it took only a single drop, mixed in an ounce of water, to heal anything, and there was just enough in that vial for one dose. He held the bottle out, nodding to the wet cloth in the woman’s hand. She seemed to understand, because she wrung the water out over the vial’s opening, allowing it to trickle inside. Instantly, the concoction began to fizz so furiously Noel could feel it bubbling through the thick glass. An odor so foul it could kill a virile wolverine from twenty meters, spilled into the air, causing the woman to gag and cover her face with the end of her long yellow vestment. “Cheers,” Noel growled, tipping the rim of the vial over his lips, allowing the putrid, bubbling blue liquid to fall across his tongue. This was an enormous mistake. The range of spluttering, gurgling and hacking noises that issued forth from Noel as he tried to choke down the Iachaol have likely never before been heard outside of the Southern Isles. They certainly had never been heard by his rescuers, who immediately took to blathering in panicked tones in their incomprehensible language, which only made matters worse for Noel, who would have given anything in that moment for one of them to think to give him a drink of water, to wash the wretched taste away, and consequently would have given whatever he had left in the world after the bargain for them to shut their gobs and never utter another syllable of their gibberish again, as he was certain, despite the fairies’ panacea, he might just die right there from contorting his body around, clenching all of his muscles, and moving broken limbs in order to try to escape the god-awful taste of guaranteed life, and he didn’t want the last sound he heard on this earth to be that woman’s babbling.